Founding Ridazz pictured above. 6 cyclists + 2 Skateboarders. 18 miles. When someone says "Midnight Ridazz!!" Moving forward we're inviting everybody to join in the fun. 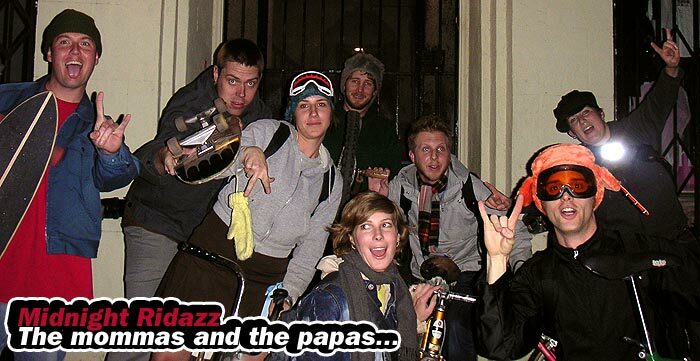 The Ridazz that be have created this site to help empower YOU to create your own rides, routes and good timezz. Start yourself a recurring ride, have a bar crawl or even throw a one timer in the daylight... It's your ride. Those who have brought you Midnight Ridazz for the past 3 years - the founders and organizers, who have planned routes, created flyers and spoke cards, led in the front and fixed flats in the rear - are stepping down. We are passing the ride on to others who have new energy and ideas. We have proudly watched our ride grow from the original 8 to more than 1,300 Ridazz. We have accomplished our goals of increasing bicycle visibility and of contributing to the bicycle culture of Los Angeles. It has been a pleasure and an honor to pedal these streets with you, and now it is time for us to move on to new projects. Now, the ride belongs to you - the Ridazz community. Use www.midnightridazz.com as your community organizing tool. If you want to lead a ride or help a ride leader - step up and announce yourself on the website forum. You may also use the website to announce other rides that you are starting or leading on other days or in other parts of the city. Thank you for the bike love and for 3 awesome years of exciting rides and great parties (remember Prom and Heavy Metal karaoke!). We look forward to going on YOUR rides. Please ride safely! And try to help your fellow Ridazz! PS: We encourage you all to keep riding and start rides in your local neighborhoods! Ridazz don't die... they multiply. Most routes take Ridazz down 4 lane streets... This allows for the use of one entire lane while allowing for automobiles to continue using the left lane to pass on by. This is perhaps the most important rule we can follow. This also means maintaining the right lane as our own not to be confused with the right hand turn lane which some Ridazz tend to drift into when it becomes available or when there are no longer parked cars blocking it. We get one single un-obstructed lane and we maintain this lane until the route changes direction.